Hello! I am loving this week's block. There is another great square, perfect for putting a large fussy cut print into. I really like the bug print I used, but I don't know if I should.... Is that a dung beetle? Do I really want a dung beetle on my bed? I guess so. Maybe it's the biologist in me. Dung beetle or no, I hope you have a great time making this block. Have a wonderful Easter week! Click here to download and print Block 25. PS. In a day or two I'm going to be sending out a special FPP pattern as Easter treat to my newsletter friends. If you aren't on the list yet and want to sign up, click here. Don't know if I would like any kind of beetle on my bed. But I do love the block. This is one of my favorite blocks! Finally took the time this weekend to catch up - yay! I found your blog today while looking online for a triangle pattern. 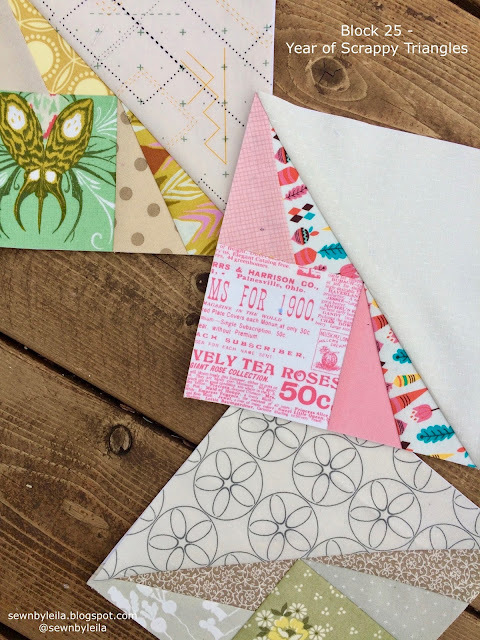 Your Year of Scrappy Triangles is amazing! Thanks for sharing your patterns! Like Sharon above, I just found your blog today...utterly impressed with your scrappy triangles and generosity in sharing. Looking forward to catching up.